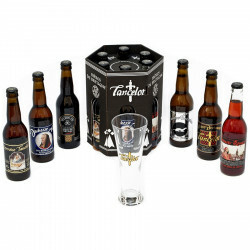 This wooden case contains 7 beers and 1 glass, a perfect discovery set of the exceptional Lancelot range. 1. Morgane, organic blonde ale, 5.5°: referring to the healer fairy of Avalon, the other Celtic world, the Morgane beer results from the craftmanship of the Breton organic producers and master brewers. With a light bitterness, this beer is quite fruity, floral, natural and refreshing. An exceptional flavour imparted by a blend of seven herbs and honey. A bright amber beer. Created as a tribute to Ann of Britanny, this beer has been flavoured with the finest hops and delivers incredible malt and fruity aromas. Made from malted barley and buckwheat, this is a typically Breton beer. Quite light and sweet, this brown beer develops a subtle bitterness under a fine thick foam. The whiteness of the ermine, emblem of Britanny, is captured in this light beer, that should be enjoyed chilled. 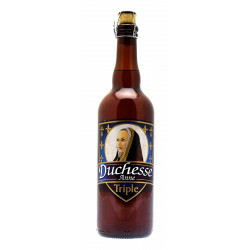 A beer with golden reflects, in the style of the top-fermented trappist beers. It has been brewed with spring oat and flavoured with Saatz hops. "Bonnets Rouges" (the red caps) refers to a Breton uprising against the Royal government in 1675. 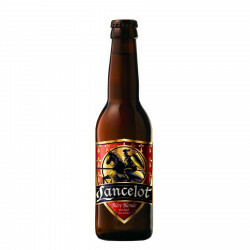 This beer develops a light fruity flavour brought by the elderberry, with a strong malt body and a touch of caramel. This gift pack is exclusively available in store. A tall 75cl bottle to share! Telenn Du is Breton, and translates as "Black Harp". A tall 75cl bottle to share! This Gallic beer reveals scents of herbs and honey. A big size bottle perfect to share! This aromatical beer with the finess hops offers malty and fruity flavors. 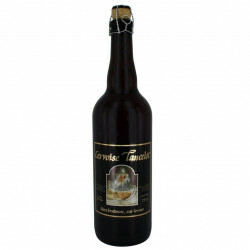 This Breton beer develops a light fruity flavour of elderberry. This beer with golden highlights has been crafted in the style of trappist monks' top fermentation beers.